THE BEST Beachfront Condo to Buy in PCB? 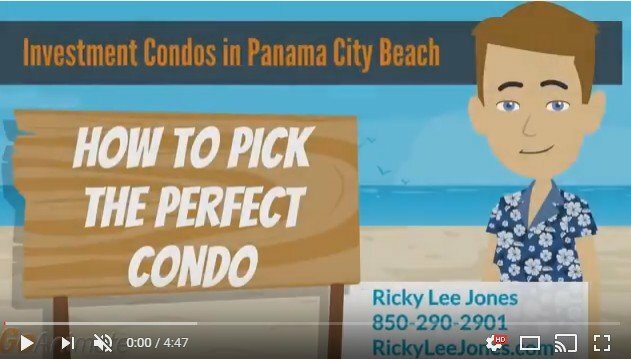 Want to Know How to Pick THE BEST Condo to Buy in Panama City Beach? Have you been considering the purchase of your very own beachfront vacation condo in PCB? If so, you have probably already discovered that this can be a daunting process, especially when you may live 500 miles away and only visit Panama City Beach once or twice a year. This is where having a knowledgeable and trusted realtor can make this process much, much easier. I work with potential buyers every day and often their questions are exactly the same. I own beachfront investment condos here in Panama City Beach, used to own a rental management company called VisitPCB.com, and have been selling condos on the beach for more than 4 years. So, I decided to share my experience and knowledge in a creative, fun and informative way using video animation. The content should prove to be very useful and I promise the animated Ricky Lee in PCB will bring a smile to your face (maybe a chuckle or two). Enjoy, and remember, Don’t Buy a Condo in PCB till you talk with Ricky Lee!